I had to laugh the other day when I saw an NBA mock draft advertising that Zion Williamson is the new No. 1 pick and that his Duke teammate R.J. Barrett is "falling." "No, not at all," an NBA director of scouting told me. "He won't go later than 3 or 4. That is not falling." Said a second NBA executive: "Zion is 1, R.J. 2, but it is still close." The Phoenix Suns, Cleveland Cavaliers, Chicago Bulls, and Atlanta Hawks are in a Tankathon and appear to know enough to have "Stopped Tryin' for Zion" or to "Give it All Away for R.J."
Williamson, who is averaging 21.3 points and 9.0 rebounds while shooting 67 percent from the field (including a ton of highlight-reel dunks), has exceeded expectations so far this season. "If I have to pick between these two gentlemen, I'm going with the outlier, Zion, no question about it," Jalen Rose said Wednesday on ESPN's "Get Up!" "Right now, if you're just going to go by skillset, it would be R.J. because he can dribble, pass, and shoot. He's a smooth lefty on the perimeter, he can play off pick and roll. But Zion, if you look at his power, if you look at his athleticism, his ceiling is so high. "And also Box Office. Selling tickets. People are going to come and watch this young phenomenon play. Now if he's able to work on his right hand and get a jump shot in the NBA, whoa, lights out for the rest of the game." Ah yes, the Box Office. Over on Forbes.com, I wrote about how Williamson could ultimately make $1 billion through his on- and off-court earnings when it's all said and done. Only three athletes are in the $1 billion club: Tiger Woods, Michael Jordan, and Floyd Mayweather, with LeBron James on his way there. Williamson has certainly exceeded expectations. Back in August, we talked to that same director of scouting, who expressed some concerns about Williamson's 6-foot-7, 285-pound frame going forward. "I think Coach K's right: I think he is graceful [at 285 pounds]," the scouting director told FloHoops then. "My concern is over the course of 82 games, that's a lot of weight to lug around at that size. If you play 82 games trying to carry that much baggage, it could be a concern going forward. Unless he drops some weight and can learn to keep it off, like [Caleb] Swanigan was. He's not as big as Swanigan was, but I'm using that as an example. That guy lost that weight and learned to keep it off and that body works for him. "If that body works for Zion, fine. But he can't be like the normal player who is going to gain weight as he gets older. That's where the concern is. Most guys if they're 280 now, when they're 26 what's he going to be? Most guys if they're 215 now, they're going to be 240 when they're 26." Now, three months later, what does that same scouting director say. Is Zion the clear No. 1 pick? Zion Williamson with the vicious windmill dunk! What do you think @DWilkins21? As for Barrett, his performance in the Gonzaga loss raised some concerns about him playing "hero ball," and Barrett appears to have heard the criticism and been receptive. The Canadian is averaging 22.7 points, 6.1 rebounds, and 3.6 assists, and NBA guys know they're going to get a proven scorer similar to fellow Duke phenom Jayson Tatum. "Everyone I've talked to says Zion is the No. 1 pick," one NBA scout said. "Zion is the better talent. R.J. reminds me a lot of Tatum. He's got a lot of Tatum in his game. He has even more fortitude attacking the basket. He's a little bit more fearless attacking the lane. And Tatum has really blossomed in that area. RJ's going to be a helluva player. And I think RJ's work ethic history is just a little bit longer. He's the conservative pick. RJ's got perimeter game, he'll attack the basket, he has a reputation for being a passer which I think is a little bit overblown. 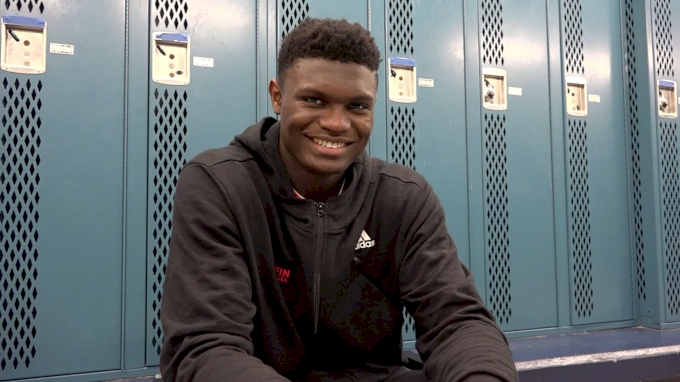 "Zion, if you just look at his rate of improvement, this is a guy that couldn't shoot a lick a year ago and now he's making step backs off the bounce, that's crazy. That's not his bread and better and the fact that he's capable of doing that in a high-pressure game with everyone in the NBA watching, that says something about this guy's work ethic."